Leafy Seadragon (Phycodurus eques). Fleurieu Peninsula, South Australia. Endemic to Australia. Classified as Near Threatened on the IUCN Red List. 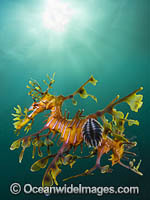 Leafy Seadragon (Phycodurus eques) amongst sea grass. Fleurieu Peninsula, South Australia. Endemic to Australia. Classified as Near Threatened on the IUCN Red List. Leafy Seadragon (Phycodurus eques) - male with eggs attached to underside of tail. Fleurieu Peninsula, South Australia. Endemic to Australia. Leafy Seadragon (Phycodurus eques). Endemic to southern Australia, ranging from Geraldton in Western Australia to the Bellarine Peninsula, Victoria. Classified as Near Threatened on the IUCN Red List.